NAPD currently convenes the following special workgroups: Strike Force, Ethicis Counselors, Communicators, and an Indigent Defense Commission. The mission of the NAPD Strike Force is to support offices, office leaders, or office staff/contractors in diverse situations of a limited or ongoing challenge, or when zealous advocacy causes a risk of sanction due to a lack of independence from the judiciary, the prosecution or funding sources. Upon request, Strike Force members offer mentorship, facilitate the exchange of resources, and lend the support of the National Association for Public Defense to local jurisdictions in order to ensure the delivery of effective right to counsel services. The First Principle of the American Bar Association Ten Core Principles of a Public Defense Delivery System is: Independence. "The public defense function, including the selection, funding and payment of defense counsel, is independent." Without independence, public defenders' ability to provide high quality, ethical, and conflict-free advocacy is threatened, thus undermining the constitutional mandate for states to provide attorneys to defendants who qualify as indigent. The Strike Force has been active in numerous jurisdictions across the country. In particular, the Strike Force has worked to promote independence in Minnehaha County (Sioux Falls), SD; Monroe County (Bloomington), IN; Hamilton County (Cincinnati), OH; Allegheny County (Pittsburgh), PA; Hinds County (Jackson), MS; and Jefferson County (Birmingham), AL. The Ethics Counselors are available to NAPD members as a resource in the area of legal ethics and professional responsibility, particularly relating to the unique challenges faced by public defenders and assigned counsel in the representation of indigent clients. The Counselors prepare and recommend NAPD positions on best practices and draft formal ethics opinions for issuance by the NAPD Steering Committee. Additionally, the Counselors are developing ethics training, such as webinars and CLE programs that focus on ethical issues and dilemmas that arise in the course of criminal defense practice. Eventually, the Counselors will broaden their scope to provide individual and program members of NAPD with information on professional responsibility rules and requirements; guidance on specific ethical inquiries; and independent consultation and confidential advice on problems or questions concerning ethical conflicts and professional conduct in legal and disciplinary matters. In December 2014, the Counselors released NAPD’s Formal Ethics Opinion 14-1. The opinion addresses the confidentiality of client information when defense team representation includes social workers and other non-lawyer professionals whose licensure is affected by statutory or professional mandatory reporting obligations. NAPD’s review of the applicable rules of professional conduct and other pertinent authorities concluded that social workers and other healthcare professionals, as well as other non-lawyer professionals who are members of the client’s defense team, may not report or disclose any confidential client information or privileged communication without the express contemporaneous permission of the lawyer for whom they are working on behalf of the client. In March 2016, the Counselors released Formal Ethics Opinion 16-1 that addresses the circumstances under which defense counsel may be required to turn over documents, records, or other material or objects having potential evidentiary value to the prosecution or law enforcement. NAPD’s Opinion explains how and when defense counsel’s duties are triggered under the applicable rules of professional conduct, as well as under other legal and ethical authorities. In August 2016, the Counselors issued Formal Ethics Opinion 16-2 concerning access to witnesses by defense counsel under the Model Rules of Professional Conduct, specifically Rules 3.4 (fairness to opposing party and counsel) and 4.2 (the “no-contact” rule). The opinion focuses on the circumstances in which lawyers can, and cannot, communicate with witnesses and others who may be represented, including those employed by a represented organization or governmental entity. In particular, the opinion deals with the availability of professional staff at mental health facilities operated by the state to counsel representing the liberty interests of patients/clients that have been involuntarily committed to those facilities pursuant to a civil commitment statute. In addition to examining the MRPC, including relevant commentary, the opinion reviews applicable case law and other authoritative sources that address the issues involved in the scenario presented. Currently, the Counselors are working on a variety of issues relating to standby counsel that may result in an ethics opinion or a “best practices” policy paper for use by defender offices. If you’re an NAPD member, regularly check the “Ethics” page on MyGideon, which is dedicated to ethics and professionalism resources. 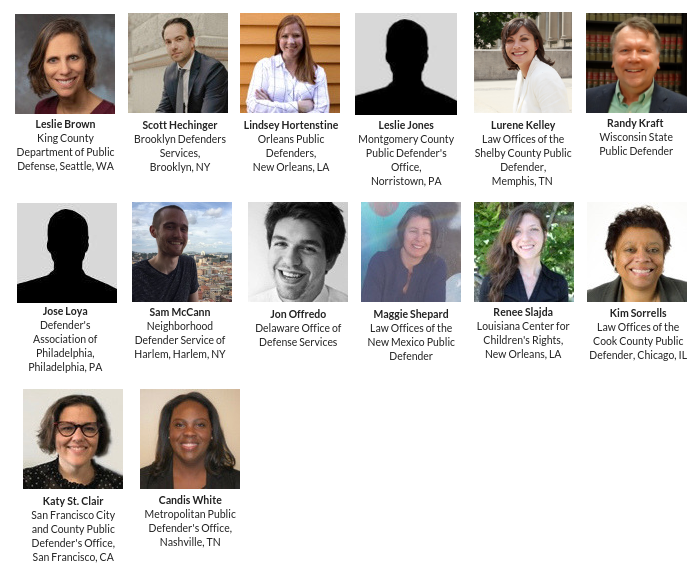 The NAPD Communicators Workgroup exists to bring together all staff working primarily on communications work in public defender offices. This Workgroup exists to support communciators across the country, to leverage the exposure/dissemination of media work, and to serve as a resource for eladers and programs interested in increasing their communciations work. 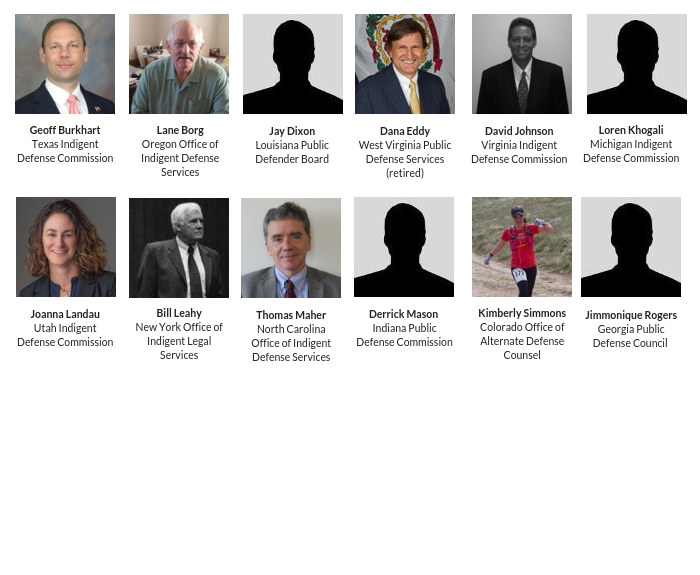 The NAPD Indigent Defense Commissions Workgroup brings together statewide public defense commissions from across the United States. The work of commissions—funding, overseeing, and improving public defender, contract, and assigned counsel programs across the state—is often different from providing direct representation, with its own set of challenges and opportunities. The group meets by phone monthly and in-person yearly to share knowledge, discuss obstacles, and cooperate with sister commissions.